Pediatric ENT of Oklahoma has experienced pediatric audiologists that strive to provide an excellent level of hearing health care that only a pediatric audiologist can. A licensed audiologist with experience in the pediatric population is the professional qualified to perform diagnostic audiological assessments for children and make appropriate recommendations. The audiologists at Pediatric ENT of Oklahoma hold the clinical doctorate degree, AuD, with certification in either/or the American Speech Language and Hearing Association and the American Academy of Audiology, with a license to practice in the state of Oklahoma. 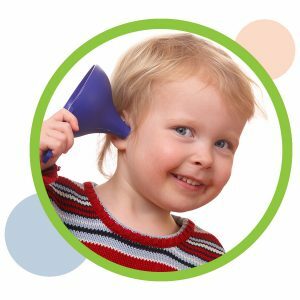 Hearing is a “first order event” and plays a vital role in your child’s speech, language, cognitive, social and emotional development. It could be that your child has a speech delay, maybe your child did not pass their newborn hearing screening. Your child may have passed the newborn hearing screening but has a risk factor for delayed onset hearing loss. Currently the Joint Committee on Infant Hearing (JCIH) recommends children with risk factors for delayed-onset hearing loss have a diagnostic audiology evaluation at 24-30 months of age regardless of newborn hearing screening results. Click HERE to read the risk factors. You may suspect that your child has hearing loss and/or your child is having a lot of ear infections. These are ALL reasons for you to schedule your child for a diagnostic audiology evaluation with the audiologists. Currently the Joint Committee on Infant Hearing (JCIH) recommends children with risk factors for delayed-onset hearing loss have a diagnostic audiology evaluation at 24-30 months of age regardless of newborn hearing screening results. Click HERE to read the risk factor.